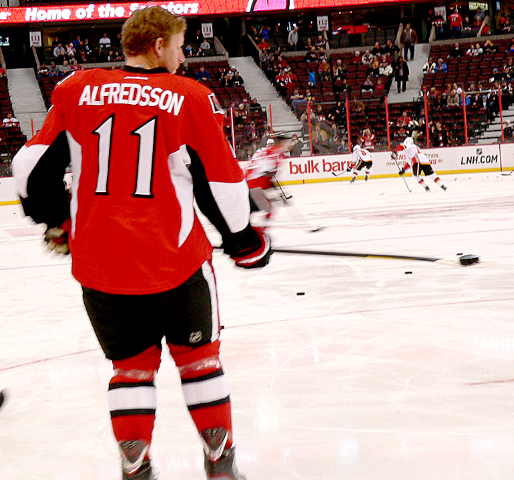 I have a confession to make: I wasn’t a big Daniel Alfredsson supporter during his early days as a Senator. But when Ottawa mayor Jim Watson presents Alfie with the keys to the city on March 5, he will be handing them to the most legendary athlete in both the history of the city, and my heart. During the mid-to-late nineties the Senators had developed from a perennial bottom-dweller into a respectable playoff club. I was ecstatic about what the team was accomplishing in the standings. But on the ice? Meh. In those days, the Jacques Martin-helmed Senators ran the trap—and they ran it all night long. As a result, it initially seemed to me that Alfie was a boring player, despite his admirable statistics and Rookie-of-the-Year trophy. But in actuality, he was simply one of Martin’s most apt pupils. It might not have been pretty to watch, but it got us to the playoffs—every year. In the late nineties the Senators became more fun to watch, thanks to a Bonk-Hossa-Arvedson line that could tirelessly cycle in the offensive zone for hours on end, and score goals in bunches. 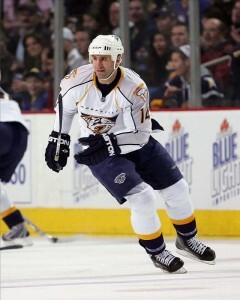 Unfortunately though, regular season success failed to translate into a Stanley Cup. Although the hated Toronto Maple Leafs consistently got the better of the young Senators in the playoffs, Alfie reacted to the frustrating rivalry by deploying an increasingly gritty and often controversial style of play against them—capturing my loyalty forever. Things changed in the mid-2000s. Players came and went, while others remained inconsistent when the playoffs began. When Martin was let go for failing to get the team to the Stanley Cup Final, Bryan Murray joined the team as Head Coach. The team’s playing style shifted dramatically to better suit the now-potent offensive squad. Alfredsson flourished in the new system, forming one of the most formidable lines of the last two decades with Dany Heatley and Jason Spezza. Although the line eventually crumbled with Heatley’s departure, Alfie continued to produce point-per-game numbers on whichever line he was assigned to. As he advanced into the twilight of his career, he remained the one player that Sens fans could always count on to give the team a spark when they needed it the most. And his deeds elevated him to godlike status in the city that loves him. When the team was beginning to look tired in Game 5 of the 2007 Eastern Conference Final against the Sabres, Alfredsson gained the zone alone and willed the puck past Ryan Miller, sending the Sens to the Stanley Cup final for the first time in modern history. When the Senators were down, out, and shorthanded in Game 3 of their 2013 playoff series with Pittsburgh, Alfredsson scored a wish of a deflection goal in the dying seconds to send the game into overtime. Although they would go on to lose the series, to me, that goal will always define Alfredsson’s career in Ottawa; he didn’t manage to win the Stanley Cup, but Alfredsson brought us to our feet so many times that it was almost okay. I say ‘almost’ because if anybody in the NHL deserved to touch the Cup, it was Alfie. In the summer of 2013, Murray had put together an offer for Anaheim’s Bobby Ryan. But when Melnyk’s budget couldn’t accommodate both Ryan and Alfredsson (who was a UFA), Murray hesitated. And Alfredsson, insulted after years of home-town discounts, walked away. The uproar among the team’s fanbase, though, was deafening. Many responded to the perceived snub by referring to Alfie—and any who still have love for him—as a traitor. Now though, after the healing salve of time has done its work, more fans have grown to accept what happened that summer. And Ottawans have shown their support for Afredsson this year in the vast majority. When the Ottawa Senators signed Alfredsson to a one-day contract this season to allow him the chance to retire here, it was the first step in repairing the damage Melnyk had done to the team’s relationship with its fan-base. 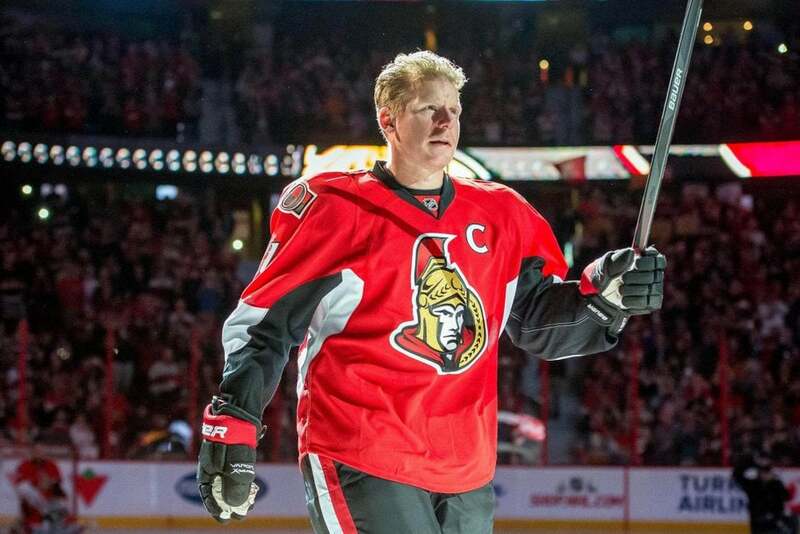 The announcement that Alfredsson will receive the keys to the city in a heartfelt ceremony is another nice gesture. Over the years, Alfie has done more for Ottawa charities—like raising mental health awareness—than any sports figure likely ever will. What I would really like to see, though, is Melnyk offer Alfredsson a front office position. With Murray leaving the team at the end of the season, the Senators will be in search of an identity. I can think of none better to help guide this young squad than the greatest player to ever don the city’s red-and-whites. And that’s Alexei Yashin (just kidding).